Featuring all of the functions of the original Ronin, but re-engineered for increased functionality and to be a fraction of the size and weight, the Ronin-M gives you the power of a professional setup in the unmatched flexibility of a one-man crew. Save time and start shooting professionally stabilised video in under 5 minutes. Mount your camera to the Ronin-M, quickly balance it, and then tap a button. The upgraded ATS (Auto Tune Stability) technology is more precise than before and completes the tuning and balancing processes with no tools necessary. Easy and efficient. Capture tight shots, even when you have almost no space to work, and easily transport your Ronin-M. The top handle bars quickly and easily twist off, allowing you to minimise its size, achieve different shooting configurations, and pack or unpack it in seconds. Your Ronin-M stands up to rugged use in any filming environment. Featuring a superbly strong and rigid magnesium frame, the Ronin-M brings increased stiffness and reduced weight. Notoriously difficult to manufacture and mould, magnesium brings you a new, more exact shooting experience while maintaining easy manoeuvrability and increasing options on set. Even with only one operator, SmoothTrack technology ensures the Ronin-M translates your movements into smooth camera angle changes. Your camera intuitively faces the direction you want, all while completely stabilised, no matter how you move. SmoothTrack settings from speed to deadband to acceleration are fully customisation, and ‘Single Axis Follow Mode’ enables you to lock two axes while SmoothTrack guides your camera along only one axis of motion. Designed with high performance in mind, the Ronin-M’s brush-less motors are incredibly precise and powerful while maintaining low vibration and increasing torque. Industry-leading accuracy is increased even further with Digital Absolute Positioning Encoders in each axis, and a much larger range of controllable motion on both the tilt (105 Up, 165 Down) and roll (± 110) axes. When shooting indoors or in tight spaces, a new Silent Mode reduces the sound of each motor to almost inaudible levels. The Ronin-M’s stabilisation algorithms are instantly changed to focus on strength for minute changes and stabilisation, ensuring the sound of the motors is not recorded by sensitive microphones or other recording equipment. Change settings on the go with the simple DJI Assistant app that links to your Ronin-M over Bluetooth. Auto Tune, adjust your favourite settings, monitor the status of your Ronin-M, and customise SmoothTrack in seconds. 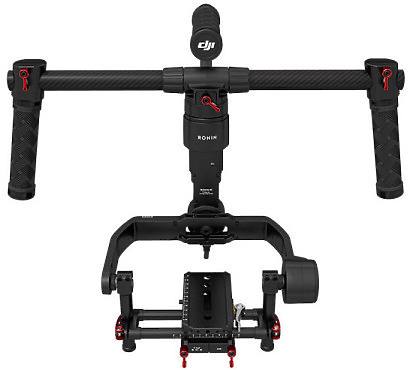 Hire the DJI Ronin M Gimbal from Procam. Best service and rental rates for the DJI Ronin M Gimbal and all cameras, lenses, sound, lighting and grip.